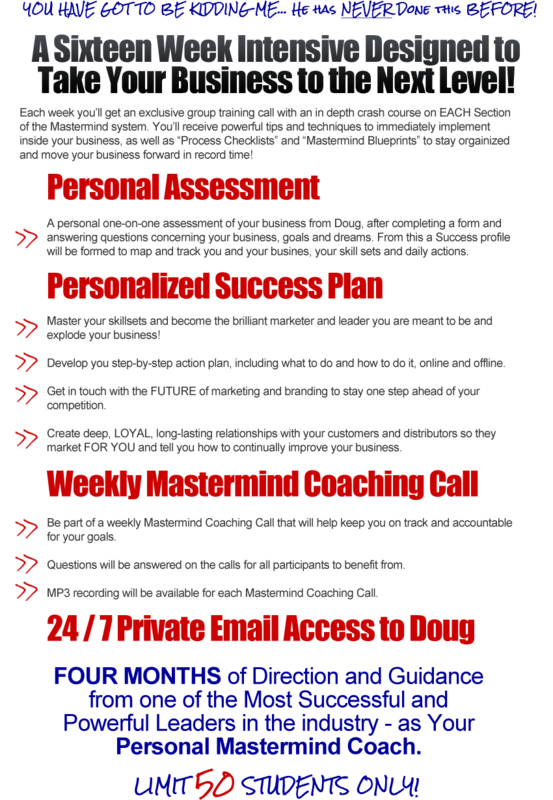 Sixteen Weeks of Exclusive Training with Doug Firebaugh! Save my place! I will be at the bank first thing in the morning so I can register here. Thanks for the opportunity. Hi Maxi! Looking forward to it! MAxi.doesn’t December feel like ages ago? Mastermind is awesome! Aren’t you so glad we jumped into this class with both feet Maxi? So glad to be in the class with you! So glad to have you in the Mastermind group MAxi! Hi Doug! I learned a lot from your tapes and CD. You are one of my most respected trainers in the world. Can I who lives at Hong Kong join the program? Thank you! I am so glad these are recorded.Is it weird to say that I often go to sleep with you talking to me, Doug??! Hi, I just received an email explain what you will be covering. Sounds like what I need heading nto the new year. You sopke of free software to get leads, you will explain that in the course? Also will the course we recorded so we can look at it again? Yes the sessions will be recorded and there are several software pieces that will be revealed and how to use them will be explained. They are not difficult to use for lead generation. Look forward to working with you in the Success Mastermind 2012. Thanks Doug! As far as the software goes are there free ones or will that be an additional cost? As being a part of your the coaching program will I have on going access to the videos once the 16 weeks are up for review and continued education? How long are allowed to email you with questions? Sorry for so many questions, but Iwant to make an informed decision. Thanks Doug! As far as the software goes are there free ones or will that be an additional cost? Most free- a couple have a cost if you use them but it is mininmal. As being a part of your the coaching program will I have on going access to the videos once the 16 weeks are up for review and continued education? You will have access to the mp3s and the webinars recorded behind a member site as part of the program until further notice. How long are allowed to email you with questions? Sorry for so many questions, but Iwant to make an informed decision. Smart man Brian! make the decision that is right for you! look forward to possibly working with you. SUCCESS IN 2012 I AM FIRED UP AND READY TO ROCK AND ROLL . SIGNED UP RIGHT OUT OF THE LAUNCH . I registred for the master mind class. However, I have not received any inrtroductory emils. The only emails I received were confirmtion of purchasing the program. Will you send the emails with specifics of the course? Dates and Time of the class? One more thing, if possible can we schedule weekely calls late night or on weekends? i am looking to start the master mind class. any detils about it? Are you sleeping on Thursday nights?? Not me! I think my team feels that I am on fire! So glad to be part of this class too Dora! Glad to be in the class with you David! I would like to know if you will be teaching step by step on how to implement what you teach in your Success Mastermind. I was wondering will this Mastermind event be based on accountability? Will there be certain things we have to do each week and followed up by you or another member or staff? When do we start the mastermind class. Also, would be kind to send me a curriculum..
Will this group be based on accountability? Also how will it be customized to each individual? Sounds like a plan. I hope I’m not too late. I have been procrastinating with my business for way too long. This is the mentoring I need to be successful and get out the rat race. To live the life I always wanted to live. Thanks in advance for making my 2012 a year to remember. I just signed up and ready to rock! Looking forwad to making this my best year ever! When can expect to start receiving information about the Mastermind Event? You’re right about that Brian! It’s already changed me and my business and we’re only 3 weeks in! You can count me in; this is exactly what I was looking for. Thank you so much! Great Mike! We needed the Great Greek Growth Meister as a part! Smile. Looking forward to working with you! So glad we made the decision to join this class! 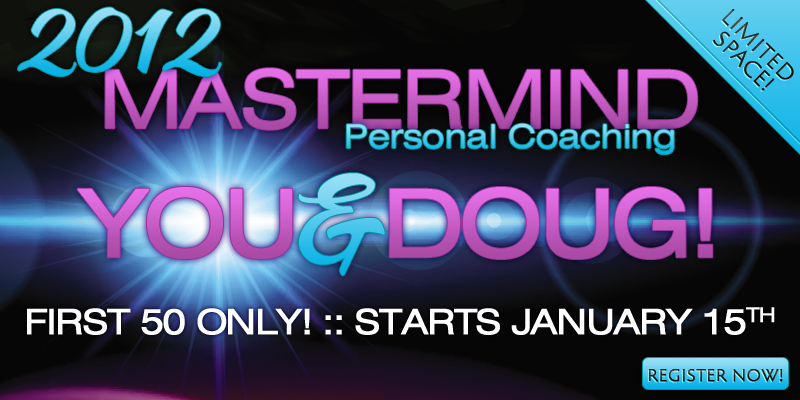 I just signed up for the Mastermind Course I am so excited about the opportunity to be able to work with you! Your free trainings are great. I know this is going to be awesome and exactly what I need to push my business to the next level. So glad to be in the Mastermind class with you Veronica! You’ve always provided cool things in other training that I’ve had with you. They’re usually something that I’ve never heard about from the “gurus” online and are usually something I’ve never thought about. So, bring them on!! I can’t hardly wait! I think this MAstermind Class is worth clearing your schedule to make sure you get it the first time! I missed last Thursday’s call, is it recorded and available for replay? As far as the Master Mind Event goes, how will we be able to access the recorded material? Will there be a link of some sort to access the information? How long will it takefor material to go from presented to a recorded post? This is a great post Doug, the government and the banks aren’t going to help bail us out. We have to do whatever we can to help ourselves and others get through any situation that is thrown at us. We are so blessed to have Firebaugh Bailout. This program has changer por life.Thanks for all your leadership. A life changer for us all Bill! The best decision I ever made, besides starting a home based business, was signing up for this class! Thanks Doug for sharing your wisdom with the other extraordinary people in this world! I just ran across this site. Haven’t talked to you in years- we were together in the past in another company. Is you Mastermind class going to be repeated? I noticed it started Jan.